There are certain childhood experiences you never forget. For Jalen Brunson, it was meeting basketball star Steve Nash for the first time at age 9. Two years ago, there was the unforgettable experience of helping Villanova win the men’s national championship as a freshman. And then there was Monday night. Villanova won its second national championship in three seasons, defeating Michigan by 17 points. Brunson finished with nine points and two assists in 28 minutes. This was not the championship-winning performance Brunson envisioned for what will likely be his final college game. After scoring the first four points for the Wildcats to set the tone, he spent stretches of the night on the bench in foul trouble. There is nothing else in college for Brunson to achieve. Voted Big East scholar-athlete of the year, Brunson will graduate after his junior year and two national championships. On top of that, he was named national college player of the year last week. Monday night, however, belonged to Brunson’s teammate Donte DiVincenzo, who scored 18 first-half points and finished with 31 total. He was named the Final Four’s most outstanding player. In 2016 Brunson was a freshman starter when Villanova defeated North Carolina on a game-winning 3-point shot by Kris Jenkins. After Monday’s game Brunson was asked to contrast the 2016 championship with the title he helped win on Monday. “It’s great how things come full circle,” he said. “As a younger guy, you’re doing what’s best for the team. Trying to make sure everyone’s playing together. Brunson is the perfect Villanova player. Jay Wright, the Wildcats head coach, has perfected a system that combines redshirting players for a season with selecting emerging talent to create older teams. Wright’s ideal player is not one coming to college for one season then leaving for the NBA. “We want somebody who wants to be in college and wants to be a pro,” Wright said Sunday. He means a player with pro aspirations but one who is willing to take the longer route, the developmental route, through college, to get there. In top-tier college basketball, old is better. Wright said that Villanova and Michigan have similar philosophies. They both want players like Brunson. “I think both of us are looking for the guys that want to be in college. And we both love having guys that are pros, too, but we want guys that want to be part of a program,” said Wright. Although Brunson will likely forgo his final year of eligibility to turn professional, he was not in a hurry to leave. He wanted to earn his degree, and he enjoyed the college life. Unlike many of his peers, young Brunson knows from firsthand observation that the pro life was no candyland. He watched his father maintain a grueling regimen just to maintain a nomadic pro basketball life. Nobody had to tell young Jalen that NBA life was no crystal stair. Because his father, Rick Brunson, spent nine grueling seasons in the NBA and playing overseas and is currently an NBA assistant coach with the Minnesota Timberwolves, young Brunson has the luxury of not feeling that he has to save his family, that he must put groceries on the table. Before Monday’s game, Brunson was asked what advice he’d offer a talented one-and-done caliber player who was torn about whether to leave college and turn pro. His father guided him through that process and demanded that Brunson focus as much on mental toughness as he did on technical skill. 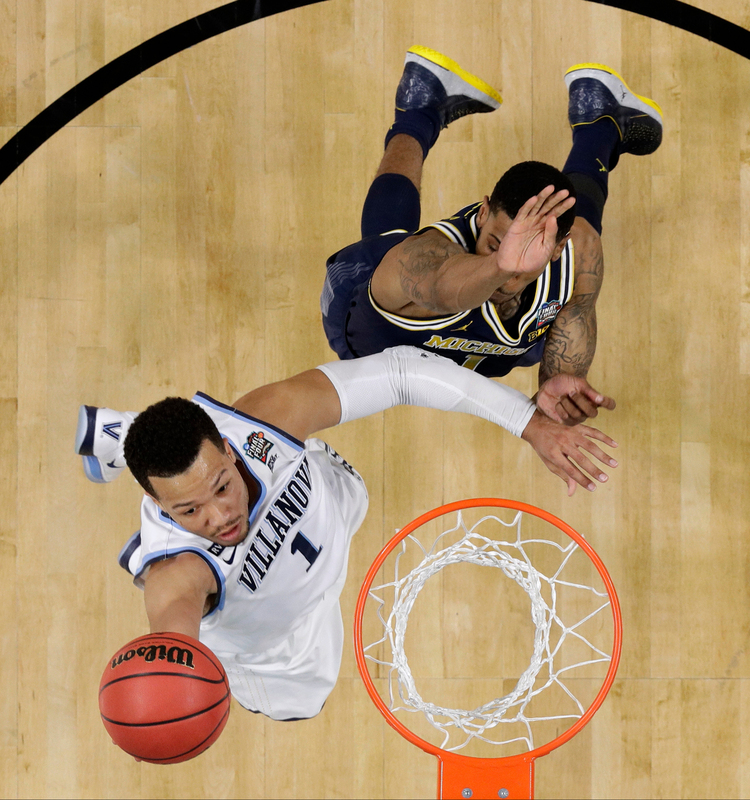 Villanova guard Jalen Brunson (left) drives to the basket over Michigan defender Charles Matthews (center) during the first half in the championship game of the Final Four NCAA college basketball tournament April 2 in San Antonio. Brunson knows the NBA and the pro basketball life in general is not the candyland many of his peers may think it is. For most, the college experience may be as good as it will ever get. His father was a four-year starter for Temple from the 1991 to 1995. His father loved the college experience. Rick Brunson once told me he may have loved college a bit too much. “I didn’t work my tail off in college as I should have,” Rick Brunson told me in April 2016, a day before Villanova defeated North Carolina in the national championship game. Temple reached the round of eight in 1993 when Temple was beaten by Michigan’s Fab Five. 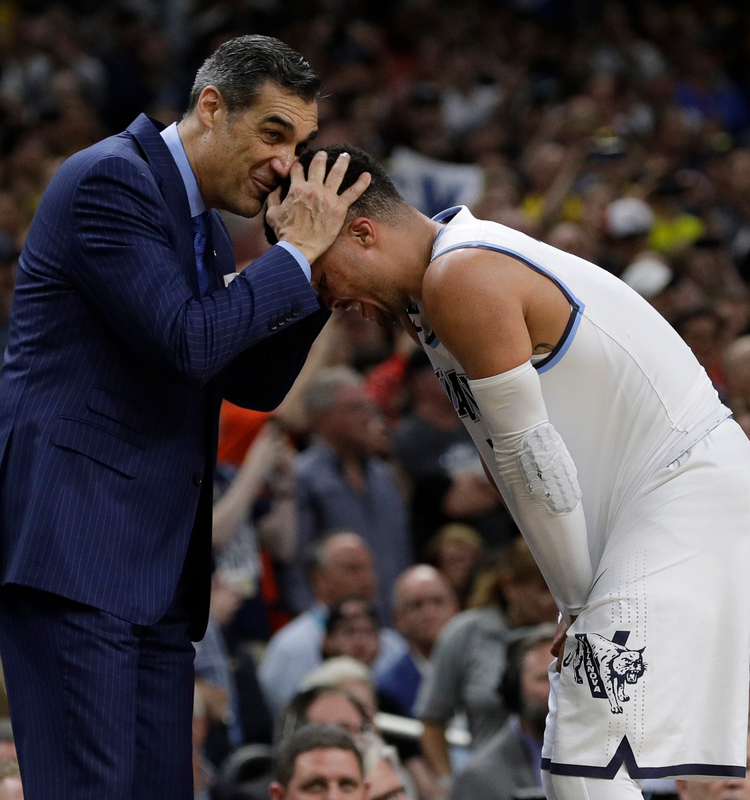 Villanova head coach Jay Wright hugs Jalen Brunson as they celebrate after the championship game of the Final Four against Michigan on April 2 in San Antonio. Villanova won 79-62. Rick Brunson became an undrafted free agent. He played in Australia, then the Continental Basketball Association. He would play for eight NBA teams in a nine-year career. During that same conversation, Rick Brunson told me that his was not the sort of NBA life he wanted for his son. “As a parent, I am trying to prevent that,” he said at the time. “You always want to give your son an easier path. He does have the mental tenacity to do what I did, but as a father I don’t want him to make the mistakes that I made,” Rick Brunson said. Brunson’s decision to stay at Villanova has worked out. It’s worked out for the university and worked out for Wright, the head coach, and the decision has certainly worked out for Brunson. He is the national player of the year, a two-time national champion and, this spring, Brunson will be a college graduate. Things really can’t better than that. 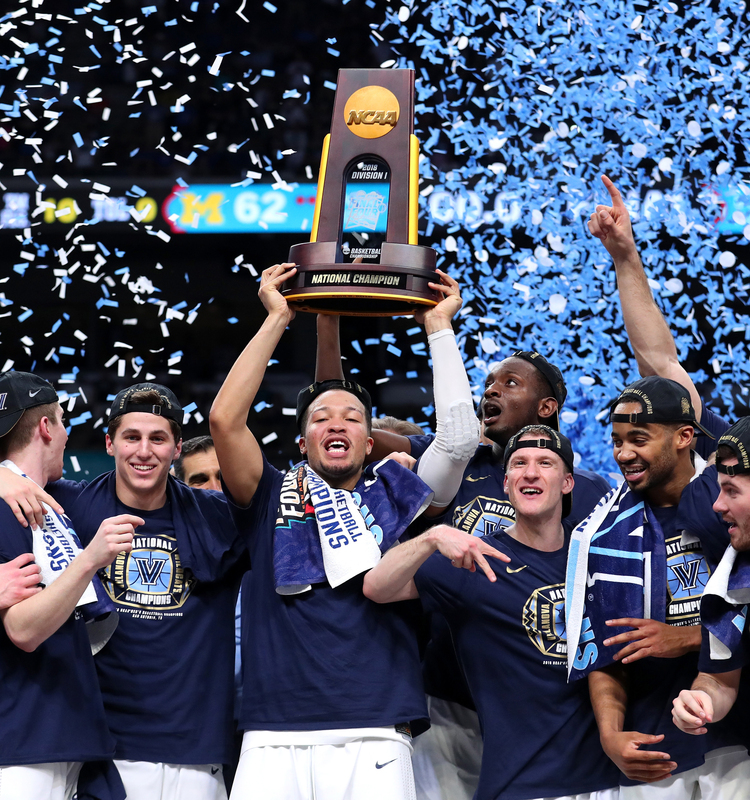 Jalen Brunson (center) of the Villanova Wildcats raises the trophy and celebrates with his teammates after defeating the Michigan Wolverines during the 2018 NCAA men’s Final Four national championship game April 2 at the Alamodome in San Antonio.